A team of researchers with members from the State University of New York Polytechnic Institute, Omaha's Henry Doorly Zoo and Aquarium, Global Wildlife Conservation and the Madagascar Biodiversity Partnership has discovered a new species of lemur living in southeastern Madagascar. 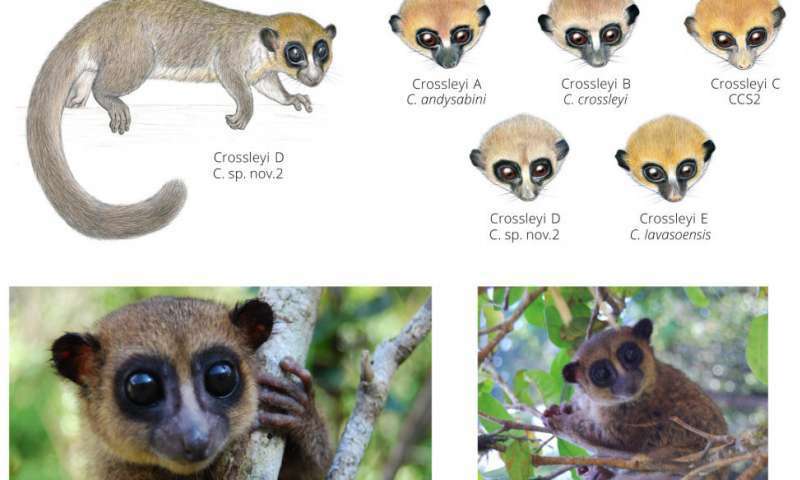 In their paper published in the journal Primate Conservation, the group describes features of the new species, some of its observed behaviors and the two places on Madagascar it was found. Lemurs are a type of primate endemic to the island of Madagascar. Currently, there are 113 known species, many of which are considered to be at risk because of deforestation and poaching. Prior research has shown that they evolved independently of monkeys and apes. The new species, a Grove's dwarf lemur (Cheirogaleus grovesi) has been found to live in two distinct regions in Madagascar, both national parks. One is mostly rainforest; the other a mix of forest and grasslands. The researchers report that the newly discovered species is a little smaller than the North American squirrel (approximately 6 inches long) and features large, round black eyes, teddy bear-like ears, fluffy long tails and dexterous hands. The members of the new rainforest species, the team reports, spend their time up in the canopy, which provides them shelter, food and a place to reproduce. They are believed to exist in social groups, but sometimes spend time alone, as well. Some specimens were captured via dart guns and nets to catch them when they fell. The team took measurements and blood and tissue samples for later study. Such samples were crucial in proving that the species was unique, as some were used to perform DNA analysis and comparison with other lemur species. The new species was named after recently deceased primatologist Colin Groves, who spent his career working to find and classify new species of mammals. He was credited with identifying over 50 species over the course of his 40-year career. The researchers note that the identification of C. grovesi is likely one of many more to come, as there are many lemurs that have been identified but not yet classified. They note also that sometime in the near future, the endangered status of C. grovesi will be assigned as well.